started his career from various tankers and cargo ships travelling all over the world. 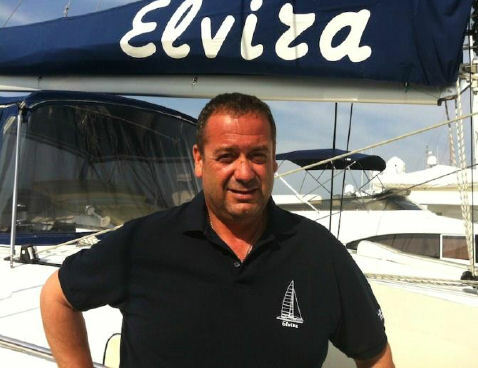 In his past experience he has worked as a captain on various motor yachts and sailing yachts since 1996 and he works at Catamaran ELVIRA since 2009. 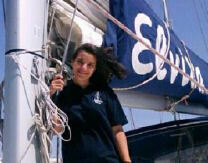 He holds a diploma of offshore sailing and advanced medical and life safety certificates. He always provides a Greek hospitality and knows the most unique itineraries for the Aegean and the Ionian Sea. He loves all kind of water sports and a few of his hobbies are fishing, football and music. 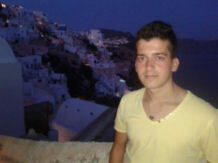 He speaks Greek, English and basic Portuguese. Cook Hostess : Anna Kavoura Michopoulou (Greek) Anna is a very experienced cook & hostess. She always keeps the boat in top condition. She speaks fluent English likes fishing, cooking, swimming, music, water sports & one of her favorite hobbies is baking pastries. Sailor: Dinos Patrikis (Greek) A sailor at heart, Dino was born and raised in Athens by a true sailing family. He was travelling from his very early years and he knows all the sailing secrets. He loves to fish, and he knows all kind of water sport activities. Dino speaks fluent English and German.